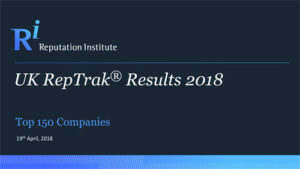 RepTrak® is the global gold standard for measuring corporate reputation. It is Reputation Institute’s flagship research methodology for measuring Corporate reputation. 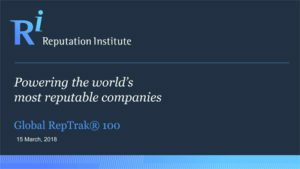 Over the past decade, Reputation Institute has measured the reputation of more than 5,000 companies, 100 Cities and 50 Countries across 15 different stakeholder groups, creating the largest and most highly referenced reputation research database in the market — best known as the Forbes-published Global RepTrak® 100, the world’s largest study of corporate reputations. Reputation Institute is the world’s leading reputation-based research and advisory firm. We are solely focused on reputation management and help clients bring order to chaos by applying proven analytical models to rigorous stakeholder research.